1 Bedroom, 1 Bathroom, 10 min walk to streercar and Freret corridor. In the heart of uptown, just a few blocks from the St. Charles streetcar you'll be blocks away from the parade route and less than a mile from the University Area. Have a casual night out in the new and swanky Freret St. Corridor filled with restaurants and award winning bars. You never know when the second lines will parade through our neighborhood so be sure to keep an ear out! Please note that the property is a 1 bedroom 1 bathroom but we offer a pull out couch in the living to accommodate up to four guests. Many of our guests have loved having their morning cup of coffee in the backyard as well as a nightcap under the light before they sign off for the night. We do have an outdoor grill if you are looking to have a relaxing evening in your new home. Lastly, we welcome and celebrate all guests regardless of race, religion, gender, or who they choose to love. We would love to be your hosts and hope to meet you soon. My name is Lindsey and I was born and raised in nearby town called Houma Louisiana where they say 'Houma is where the heart it is.' The truth is though , New Orleans has always had my heart. This city puts a bit of a spell on you and for some, it makes leaving impossible. There is a certain romance to here, whether it is the beautiful french architecture, the narrow french quarter streets, or the carriage rides through Jackson square. It's no wonder that this is the city where I fell in love with my husband and we have been tourists in our town ever since. When we aren't sailing or travelling, we love having stay-cations right in our own backyard. Its very easy to fill a care-free day with beignets, bloody marys, streetcar rides and wandering the quartering with no plan except to live in the moment. We began looking for our first home in the spring of 2013. It was our first purchase but we knew we want wanted to go big or go home. We wanted a multi-unit property and we were not afraid to get our hands dirty. Maybe we had watched too much HGTV or we are just gluttons for punishment but knew we just had to do a renovation to an older house. When we found this house we knew it was the one for us. The night we saw the listing we went over to the property and tried to scope it out in the dark because we were so excited. The neighbors must have thought we were crazy because i was on Marks shoulders trying to get a peek inside because we didnt want to wait for a showing. Things worked out and we got the house. 6 very long and expensive months of hard and no social life left us with the house we had started out for. We have 3 units on the property. Our unit is upstairs and we have 2 units downstairs. One of which is long term tenants and the other is for fun loving traveler like yourselves. We have loved so many things about our home but one things we could not part with was the original wood floors. Our floor were even able to make it through Katrina mostly undamaged. The wood itself is 400 year old old growth pine. Completely irreplaceable as these forests no longer exist. We also enjoy the recently updated bathroom where can enjoy a full walk in tile shower with a river rock massaging floor. View more about Mark B. We have a recently updated bathroom walk in tile shower and river rock floor. Living room seats 5 people. some basic items. cooking oil, seasonings and condiments are all standard. The apartment was cozy with fun decor from around the area. Owners were very attentive and helpful. The trolley was three-fourths of a mile from the apartment which made getting around easy. We came for a couple nights after getting married and we biked the whole time there and it was the perfect size and location for biking! Mark & Lindsey were the sweetest and super helpful! We really enjoyed our stay with Mark and Lindsey. First of all they accommodated us with an early check-in and we were greeted by jazz music when we opened the door to the apartment. A quick tour assured me that these were people who cared. The artwork on the walls was carefully chosen and not "hotel bland". In fact, I saw examples of what I labelled the Blue Dog Group, in a shop window while riding the Canal Street streetcar. 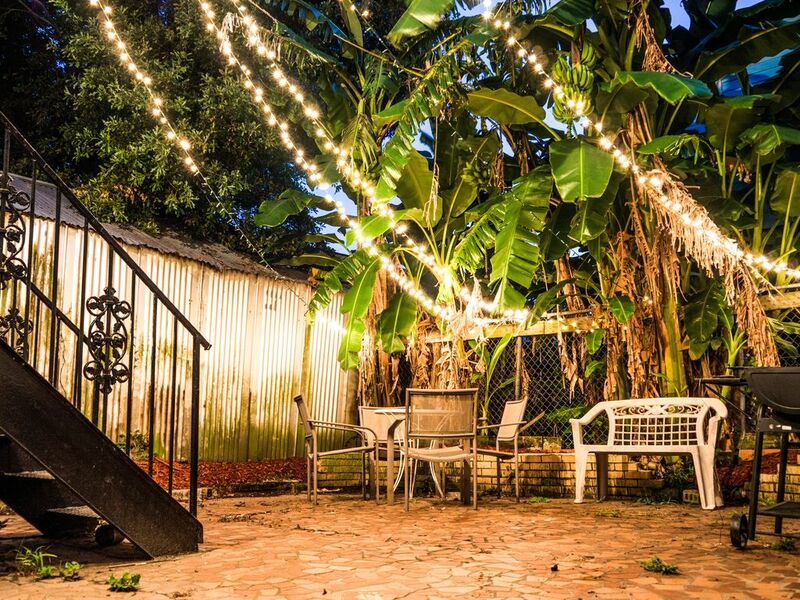 The apartment and backyard were a quiet oasis, just what is needed to recharge from the busy, busy, busy-ness of the French Quarter--even on week days! I was introduced to Pecan Liqueur at a previous stop in Louisiana and asked our hosts where I could purchase a bottle. They went above and beyond by purchasing a bottle and gifting it to us. I'm serving it sip by sip, because I know I won't be able to find it in Indiana. We chose to use Uber to get around. Drivers never seemed to be more than five minutes away. Very convenient. The apartment was clean, well furnished, and our hosts were grand. We would definitely stay here again and recommend to our friends. This place so was super cute and cozy! The neighborhood was quite, safe and close to many attractions. We would absolutely stay again if we come back to New Orleans. Thank you Mark & Lindsey. This place is AMAZING! If we ever come back to NOLA, this is the place we want to stay! I recommend this place to everyone! !Thank you Mark and Lindsey! Very nice place. Owners are wonderful!